In just its second generation, BMW's Z4 has evolved from a Porsche Boxster rival into more of a comfortable, sophisticated Mercedes-Benz SLK competitor. But have its new priorities robbed the Z4 of some of its raw charm and ingrained excitement? The range-topping twin-turbo 3.0-litre six sDrive35i would suggest otherwise, serving up a storming 225kW and 400Nm. Although its weighbridge ticket reads a hefty 1580kg, it hits 100 kays in a claimed 5.1sec, just quicker than the Boxster S. The only real disappointment is the soundtrack, with the turbos muffling the induction and exhaust. Point the Z4 at a sinuous ribbon of blacktop with 'Sport Plus' mode dialled up to delay the onset of the stability control, and you'll discover there's little in the way of on-the-limit adjustability; you get entirely predictable understeer, followed by the onset of roll steer at the rear when you lift the throttle in constant-radius corners. It's foolproof, but lacking in excitement. The Z4 sticks with an electro-mechanical steering set-up, which, at 2.7 turns lock to lock isn't quick, but is reasonably alert off centre. The major problem, however, remains a lack of feel. With the car set in Normal mode, the steering is rather light. Switch into Sport and/or Sport Plus and the weighting increases. The ride is far better resolved. 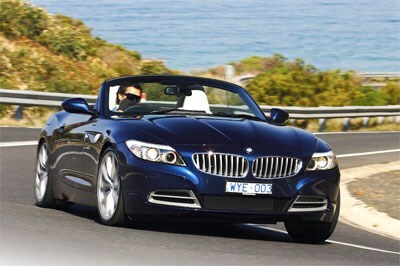 The Z4 trades some of its renowned body control for a touch of added comfort. Roll remains very well contained, but primary ride has improved greatly. The new Z4 won't be everyone's cup of tea. But with its distinctive looks, classy cabin, strong performance in sDrive35i guise, refinement and increased luggage capacity, it is certainly going to make life harder for SLK, and even Boxster. The problem is it's not quite as involving as its $116,900 might have you believe. We await the arrival of the Z4 M with interest.